this is an adorable quick and easy diy that i saw in a magazine last summer and never got around to doing. i actually had already posted/shared this great idea on my white dress photography blog a while back and felt it appropriate to share in this setting as well! find some old bottles, from anything really....oil, pop, wine, etc....clean them really good, so as to get the sticky labels off. 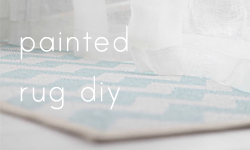 take some old paint from previous projects (or you could always buy samples at your paint store for about $5) and thin it with a little water. very little water, or it will run! coat evenly by moving bottle. allow to dry. because i use laytex paint, i can't fill these with water and put flowers in them. solution? next time you buy real flowers, collect the little stem water containers or purchase some from a florist. now you can enjoy your bottles with single blooms. really pretty. super easy. enjoy! Gorgeous bottles Natalie, I'll add these to my weekend post! 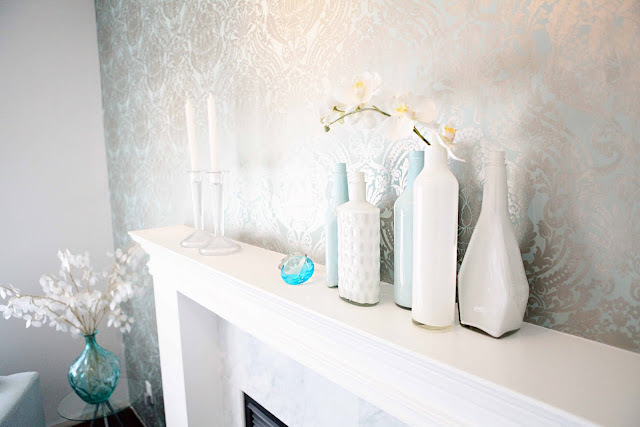 Where oh where is that wallpaper from, I adore it! totally gorgeous! I LOVE this idea!!! Hi Natalie, I'm a new follower and I love your style. You have quite a few great projects! I'm a new follower from CG. I love how these turned out...great job. Following you now..! 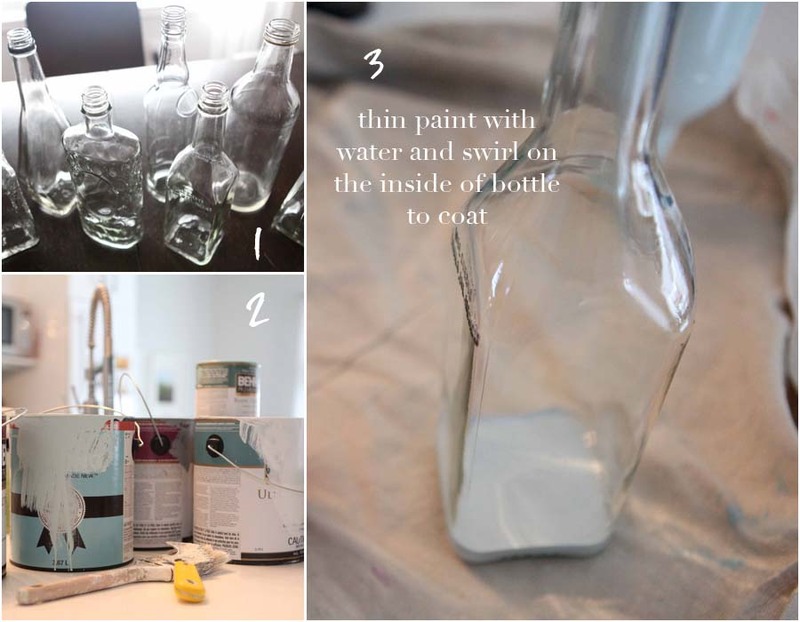 Love this idea...I wonder what would happen if I put white paint in a green wine bottle. I might have to try it! Love your blog. Keep up the awesome work! Thanks for all the awesome comments ladies! I like the idea of trying white in colored bottles! I might try that too! Absolutely LOVELY! I MUST DO THIS! 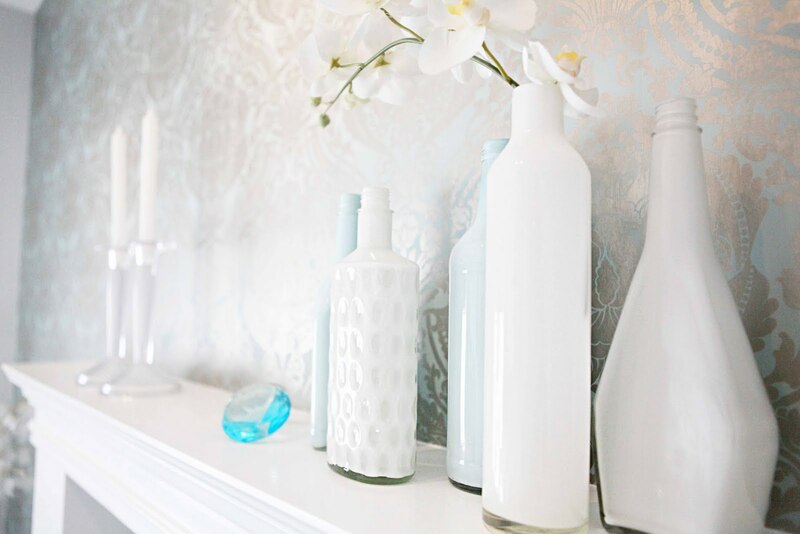 And that wall paper is divine, such an incredible combo it makes with the new bottles! Thanks endlessly for linking up and sharing! Thanks Jen, it's an awesome diy! So pretty! Obviously 100% customizable too, which is good! Thanks for this tip. I love these bottles. Especially that pretty pale blue color with the white ones. Wow, what an impact. and so simple to make, why didn't I think of that? They look just precious! Hi - new follower here. Those bottles are gorgeous. I'm going to have to try that sometime. I love this project, can't wait to give it a try, you just made it look so easy! I'll feature it next week! They are fab! I just spray painted my bottles, but yours look so much more chic. These look so very beachy -love them!! Hi there - visiting from Coastal Charm. This is such a great idea! I have tons of clear bottles that I was ready to give away, now I know what to do with them! I saw a tutorial similar to this one that used special glass paint. While the translucent effect was nice, I really didn't want to run out and buy something like that-I love that yours uses leftover paint you already have-and that it came out looking so fantastic! Also-as an added bonus I can prove to my husband that saving all those different bottles and jars down in the basement wasn't really crazy-see, it's useful. Also, you MUST tell us where that wallpaper is from! It is simply DIVINE! I bought this wallpaper from Home Depot....at the time I had to custom order it, but now they just keep it stocked, so it's readily available. I honestly can't remember the company name! So check out Home Depot. That's here in Canada though, so things might be different in the states. Not sure! oh I love this SO much! and the wallpaper...new follower here! you have the prettiest house and the BEST ideas. thanks so much for sharing it with us! I LOVE this! Love the colors... You should come and visit my "Share your Awesomeness" link party tonight and share your project. Simply beautiful! Beautiful... they look just like milk glass! I am a new follower because the post is fantastic!! I am going to pin this to pinterest too!! I am visiting from Sugar and Dots and I love what you came up with! I am hoping you will come to my blog Friday and link it up to my Delicately Constructed Fridays!! This is a great tutorial, I tried this before and it went so wrong! The bottles look wonderful, thanks for sharing. Beautiful colors! I've tried several times to make these but I just can't seem to get it down! They always streak or drip off the sides...perhaps I'll give them another try. I really like this idea. What type of paint did you use for this? Just plain old laytex left over from other projects! I LOVE this! These are just so elegant and tasteful! LOVE THEM! I am a new follower! I featured you here is the link to the post: http://www.thirtysixthavenue.com/2011/06/sticker-time-3.html Thank you for sharing! Those turned out great, I really like the look. We have a handful of antique looking bottles that I'm going to need to try this out on. I've got to try this! Yours turned out great. Thanks for sharing this. 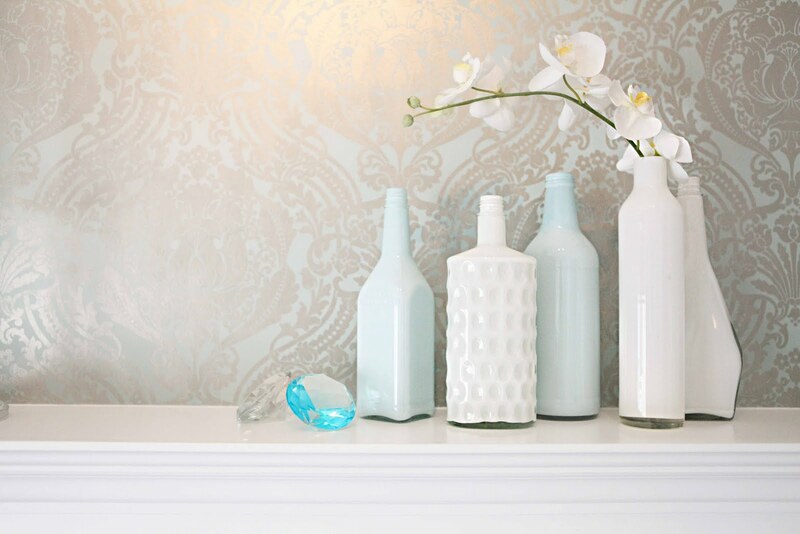 i really love the wallpaper and the bottles look beautiful against it.what is the color blue that you used? (if u still have the paint). that is a really great color. im really getting into the pale blues. thanks for sharing your idea. 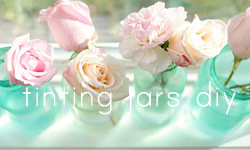 These painted glass jars are gorgeous!! I love the soft color - and that pale blue is to die for. Oh my gosh. These are beautiful. I've seen a lot of painted bottles around blogland but yours are the best I've seen. Fabulous. I would be thrilled if you shared this project at my linky party. Simply stunning! The colors are gorgeous and that wallpaper is to die for! gorgeous. and thanks for the tip about using the little water thingies from the florist, that's a great idea. 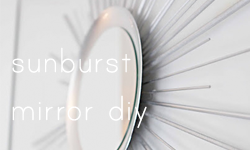 Great tutorial (and fabulous blog too!) 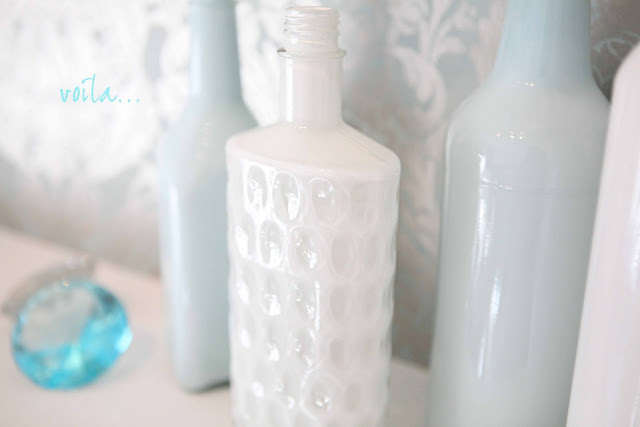 I linked this to my milk glass post too today - the best DIY posts I can find! wow, i love this diy idea! This is amazing! Thank you so much for sharing! I did this last weekend and my bottles turned out great! I've posted a link to your site! These are so lovely! Just found you through Pinterest. I really want to be able to put water in my bottles . . . . Do you think there's a different kind of paint that would allow this? Also, I wish your beautiful blog allowed me to follow the comments. Please consider adding a plugin that would allow this. Your work was simply amazing. I am impressed with you idea on how to make that simple bottle looks gorgeous. I so love it. We can make this also in our house as a family bonding I am very glad that I came across with your great work. You did an excellent project so please keep it up. Tried to reach you earlier by email. 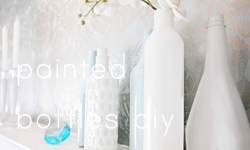 I found your painted bottle diy post while searching for images of painted bottles. 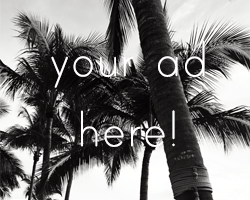 Real Style is a fashion and culture site and we have written a similar post and we were wondering if we could use your images with a link back to your post and site. Let us know and thanks for your time.